I suppose the first thing I should say about myself is . . . . *sigh*, I somehow find myself always busy! So I'll be lazy and point you all to my MacWeather introduction if you want more details: http://www.macweather.net/viewtopic.php?f=22&t=198. However, the key points are probably I'm the AppleScript guy for WeatherCat. I've written over half a dozen AppleScript add-ons to LWC that have been ported over to WeatherCat. Judging from what other folks say - they appear to be somewhat addictive! Once you get them installed and working, it becomes increasingly hard to go without them. I've had all sorts of interests from amateur astronomy to scuba diving . Like others around here I've been attracted to photography but an no more than a rank amateur. The one thing that is likely to be mentioned from time to time is my current automobile "restoration" project. Our family heirloom 1965 Buick Special Wagon is still limping along waiting for a new engine. . 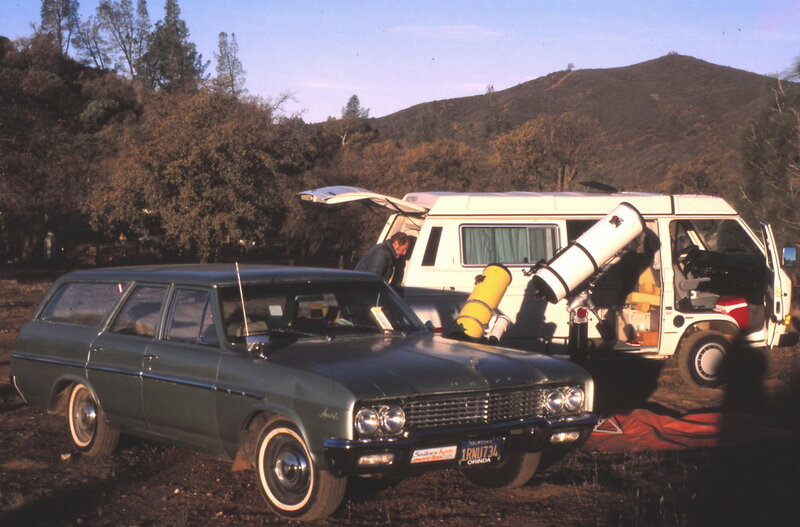 The car has been in the family since 1968 and has been my car on all sorts of remarkable adventures. A "barn find" this car is not. She has been on the road all of them 47 years! Alas the car needs a new engine and back in May 2011 I ordered a "super-deluxe" 448 cid (7.3 liter) big-block Buick engine. The car and I are still waitin' . . . . .
Hopefully that will be enough to either satisfy your curiosity, or to prompt you to click over to MacWeather for more info. Thanks to everyone who has come over here and for supporting WeatherCat!! Re: Who is Edouard in Nor Cal? Ha! Nice to run across another amateur astronomer! Haven't had my 10" LX200 GPS out for some time...like you, I'm always busy! Hmm, another Meade fan - huh? The bigger scope is a 10" version of the Newton/Cassegrain convertible scope which the fellow in the photo had built and inspired me to start this long project. I'm in the process of having the drive train upgraded in my trusty wagon . . . . another one of those long projects!! With all this, I haven't mentioned the other scope. I bought a smaller 6" Meade LXD-75 Schmidt Newton telescope in 2000. However, it hasn't gotten much use - again because my trusty wagon isn't up to the task with her worn out engine. So perhaps I'll be getting back into Astronomy next Spring - we'll see!